Chloe Hardy, from the Sheila McKechnie Foundation, talks about the characteristics which people who drive social change are recognised to share. Community led activities and initiatives which produce positive local change are the very essence of Big Local. Research carried out by the Sheila McKechnie Foundation about communities who make positive change happen, makes thought provoking and perhaps essential reading for the Big Local community. Through hundreds of conversations over the course of a year, we collated our research to map how social change happens from the people who do it, in our report about Social Power. By using the term ‘Social power’ we mean civil society’s ability to create transformational change for individuals, communities and society as a whole. In our report, we talk about the people who really drive change as ‘change-makers’. 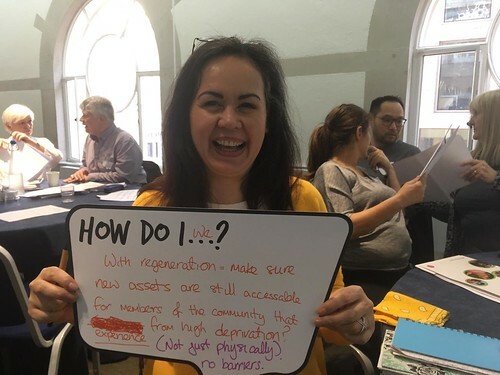 They may be people affected by an issue who are trying to do something about it, campaigners, innovative service providers, local activists, community organisers, in fact anyone who is making a social change, big or small, part of what they want to achieve. One of our most striking findings was how much effective change-makers had in common. These characteristics became the ‘Twelve Habits of Successful Change-Makers’, covering everything from how you focus on your purpose, to how you interact with others, to how you learn. (Chapter four, pages 28-35). Every journey begins with a single step, so why not take some time to read the Twelve Habits section of the Social Power report? We hope that by using our findings to examine your Big Local, you will unleash even more of your own social power. Of the twelve, I am sure we can all find a handful that come naturally, either because of who we are or the nature of our organisation. Some of the community activists we spoke to were living examples of number four – persistence, perseverance and resilience. Local organisations were often better at answering number five – ‘in whose name?’ – loud and clear. I would venture for most communities and organisations, time pressure can tempt us to skip number eleven – evaluating what matters and learning from it. And who hasn’t occasionally wished that change was straightforward, as we battle to understand a complicated world in our pursuit of number two – looking at the bigger picture? Exactly what these habits look like in your Big Local area and for you personally will be unique. But how they hone and shape your work is shared by everyone, from community groups to mega-charities.